about our Moon, and what mysteries remain still to be solved. Find out how you can take part in the efforts to solve these mysteries, as well as enjoying the Moon's spectacular magnificence for yourself! Gerald North graduated in physics and astronomy. A former teacher and college lecturer, he was also a Guest Observer of the Royal Greenwich Observatory. He is now a freelance astronomer and author. He is a long term member of the British Astronomical Association, and has served in several posts in their Lunar Section. 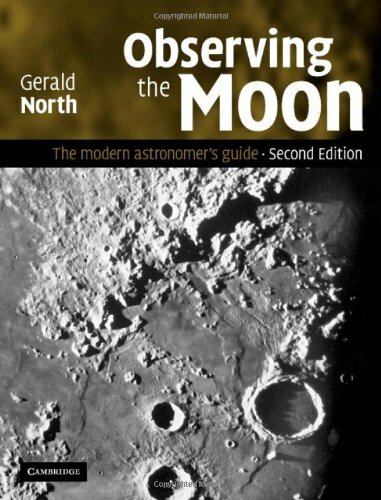 Other observing guides include the acclaimed Advanced Amateur Astronomy (Cambridge University Press, 1997) and Observing Variable Stars, Novae, and Supernovae (with Nick James, Cambridge University Press, 2004). How big a telescope do you need? So, what telescope should I spend my money on? What might be the cause(s) of TLP?